I enjoy a retro kitschy Christmas, so of course I needed funky stockings. These are made with Fairfield World OlyFun and Aluminor (a new fabric!). The Aluminor comes in silver and gold. The OlyFun comes in 18 colors plus 4 metallics (also new!). You can mix and match the colors and textures for your own custom stockings. I chose a monogram. My daughter and I share the same 1st initial, so I used different Aluminor metallics and color combos. Monogram stockings are classic. You could decorate these further with paint, glitter, and jewels. 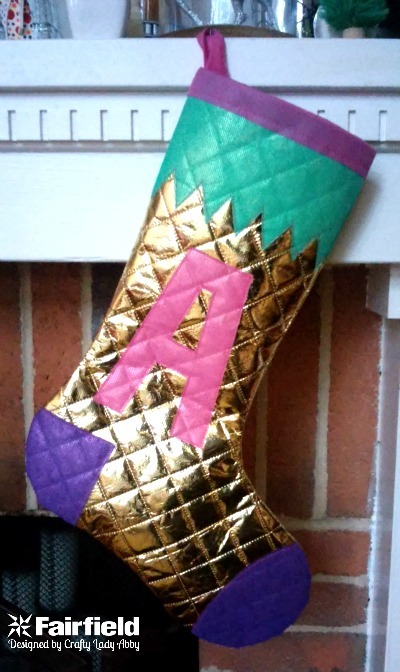 The Aluminor works best for a simple stocking shape, but the decorations can be wild. Make your own Christmas Stockings with Aluminor and OlyFun on Fairfield World! I'm a Master Maker for Fairfield World. They send me their products to make projects with and pay me. I always make projects that suit my style and are a good use of the products. I like to think out of the box, when possible. These fabrics are seriously great, and if you buy them, I won't be compensated, but you should still buy and make awesome things with them.